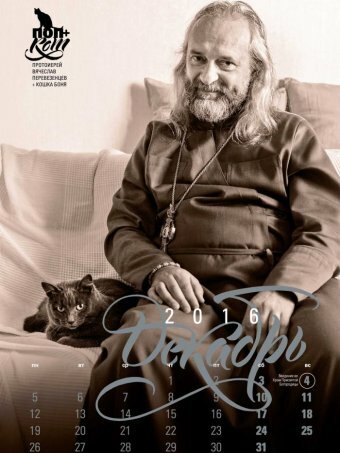 In a rare venture into popular culture, bearded Russian Orthodox priests have posed as models for a glossy 2016 calendar — cuddling their pet cats. 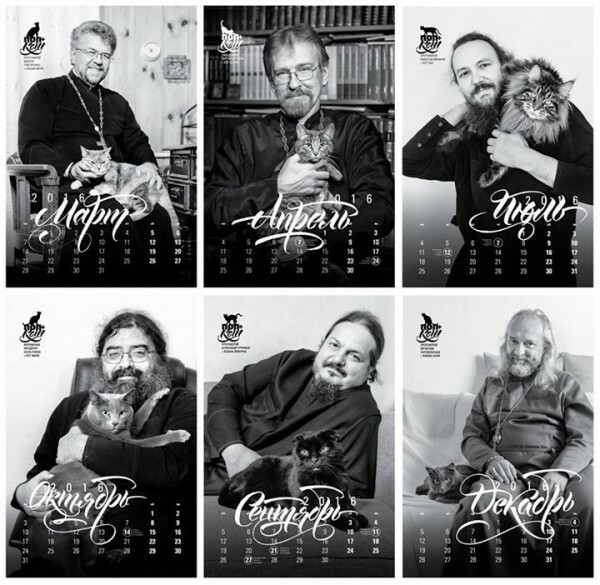 The calendar put together by an Orthodox news website sees 12 smiling priests in dark robes relaxing with their cats — sitting side-by-side on the sofa, or having the pet sprawled on their chest or draped round their shoulders. It is the first calendar to depict priests in such a style, according to one of the creators, Ksenia Luchenko, a journalist at the Pravmir website who came up with the idea. She conceded Russia’s powerful church was not usually open to such an informal depiction of its clerics. “That’s why we did it ourselves. We’re not linked to official structures,” Ms Luchenko said. Religious-themed calendars usually just depict holy icons. The calendar is not officially endorsed by the Russian Orthodox Church. “It’s all their own cats — nothing was staged,” Ms Luchenko said of the casting process for the calendar. Nevertheless the cat-owning priests in the charming black-and-white shots by Anna Galperina turned out to be “nice-looking,” she added. But the idea has won praise from media, with the Komsomolskaya Pravda tabloid writing that “the priests are kind and twinkly, and the cats are cute and fluffy”. The calendar was even covered by Russian Cosmopolitan magazine. “Not all priests agreed to do it. Not everyone wants that kind of publicity,” Ms Luchenko said. 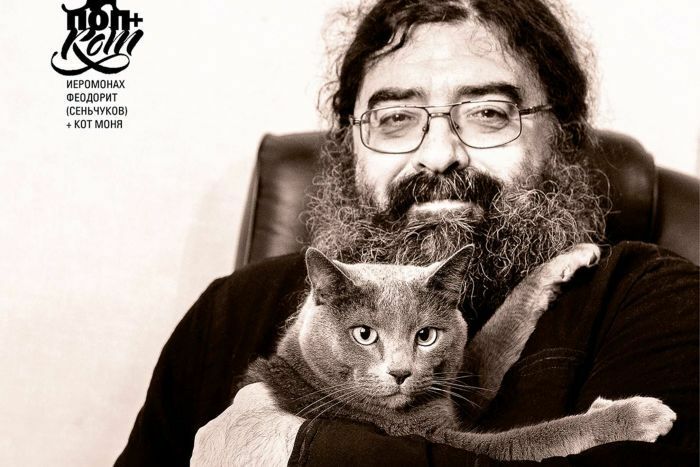 The calendar called “Pop i Kot” or “Priest and Cat” grew out of a photography book project showing Russian priests in their everyday lives, she said. “By chance we had a photo of a priest with a cat and I thought: why not do a series?” Ms Luchenko said. The Russian calendar had an initial print run of 1,000 copies but that looks likely to be extended. Ms Luchenko said several churches had ordered them to sell in their shops. The creators have also planned a presentation with some of the priest models later this month, raising funds for an animal shelter.